Accessibility for New England is a proud authorized installer of Aqua Creek Products, manufacturer of total solutions for pool and spa access. 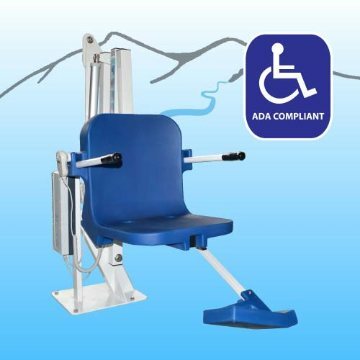 Lifts they offer several different lift models, including 8 ADA compliant designs. Their innovative lifts are made of type 304L stainless steel with a durable epoxy powder-coating. This sturdy construction provides our customers with the most durable and reliable aquatic lifts on the market. ADA compliant pool & spa lifts are ideal for both commercial and residential use. Whether you need to bring your facility up to ADA standards or you need an easy way to enjoy your backyard pool or spa, Aqua Creek has a solution for you! Call us at 888.9NE.LIFT for more info or to schedule an install. The Pathfinder features a sleek reversible design. Minimal moving parts make this compact lift easy to maintain. Capable of supporting 300lbs, the Pathfinder is our most affordable ADA compliant lift. This adaptable design allows for multiple installation options. The Pathfinder upholds Aqua Creek’s high standards for durability and reliability. The design also features a built-in deep draft configuration.